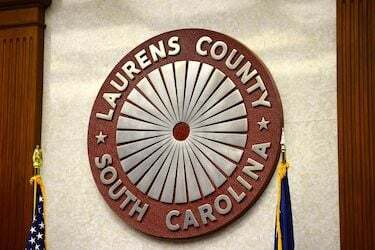 Laurens County is taking action to save money on electricity. Based on a recommendation by Public Works Director Dale Satterfield, the county council has approved $190,485 to adapt all lighting in county facilities to LED. The goal is to realize an annual savings of $100,000. It was among several money-related measures taken by council at its April 9 meeting, as budget time approaches. Council authorized the repayment to the Joanna Fire Department to repaint a platform truck it acquired from the Chapel Hill, N.C., Fire Department. The truck was painted Carolina Blue. For painting and minor body work, the cost was $24,300. That brought the acquisition cost of the used truck to $234,300 – below the $250,000 that council originally authorized for the purchase. Money will come from the Fire Service Reserve Fund, with a balance now of $650,000. The Joanna Fire Department needs a platform truck because it is first responder to emergencies at Norbord (forestry) and Cobb Industries (animal feed), between Joanna and the Newberry County line. The platform truck is painted to match the Joanna fire fleet, council was told. Council authorized $8,000 from the fire reserve fund for the county’s swiftwater rescue team. The money will replace one of the team’s inflatable boats. Laurens County needs a swiftwater rescue team to respond to emergencies at the shoals park in Ware Shoals and in case of other flooding emergencies. The team’s boat was damaged during a deployment to Hurricane Florence, but FEMA would not pay for a replacement. The federal agency said the boat was beyond its useful life span, the council was told. The team has two other inflatable, motorized boats for swiftwater rescue, and these were purchased with grant money. Council approved an update of flood zones for Laurens County. Codes Enforcement Director Chuck Bobo said the new FEMA flood maps need council approval to take effect June 20. The change will assist some homeowners at Lake Greenwood, Bobo said. Council also approved resolutions for April as Child Abuse Prevention Awareness Month and this week, April 14-20, as Telecommunicators Week. Council Member Garrett McDaniel requested the child abuse awareness resolution, and County Emergency Management Director Joey Avery requested the Telecommunicators Week recognition. The Muffin Mam FILOT (fee in lieu of taxes) and location in the Hunter Industrial Park, Laurens, ordinances were adopted on third (final) reading by the Laurens County Council. The $18.8 million project is committed to the creation of 114 new jobs for the county. In preliminary budget discussions, council heard that services-expenses of the EMS are going to have to be cut if the current 7-mil tax levy for emergency service is going to be maintained. “I ride up and down 385 all the time, and I keep seeing our ambulances riding back and forth to Greenville to accommodate where a patient wants to be treated,” said County Administrator Jon Caime, adding that extra service costs the county EMS $180,000 a year. One solution could be to collect more from the people charged for these transport services – right now, just 30-50 percent of the people pay those bills, the council was told. Caime said overall (operations and maintenance) there is a $600,000 EMS deficit and that would require a 3.3-mil tax increase to balance. Council can impose that tax by taking EMS out of the General Fund budget and designating it as a supplemental-revenue account of its own. Council will consider that as budget talks progress in May and June.